Spectra is converted Ottoman House in the old city at Hippodrome Square. 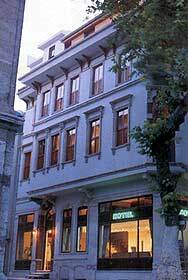 It is located close to the Blue Mosque, St. Sophia, Topkapi Palace and the Grand Bazaar. The facilities included are nineteen attractively decorated rooms with private shower and WC, a restaurant, a bar a terrace. The terrace has a lovely view of Hippodrome Square, the Blue Mosque, St. Sophia and the sea of Marmara.